College of Arts and Sciences (CAS) offers Bachelor of Arts in Communication, Bachelor of Arts in Multi-Media Arts and Bachelor of Science in Psychology programs. The college is also known as the service department as it caters to General Education (GE) courses of all programs. The College of Arts and Sciences (CAS) envisions the development of students who are dynamic, highly adaptable and are inspired by the values and ideals of Dr. Jose P. Laurel, through the tutelage and guidance of qualified and dedicated faculty and staff. Guided by this Vision, the College of Arts and Sciences offers general education courses that aim to develop the fundamental knowledge and holistic skills that serve as effective foundation for subsequent professional courses, such as those in Engineering, Business, Nursing, Technology and others. This core of General Education Courses also aims to contribute to the development of the totality of the human person, as he/she relates to his/her environment, both nationally and internationally. The College of Arts and Sciences also offers professional academic programs in Education and Communications, emphasize English and technical proficiency as needed in the field of actual practice. In these ways, the College of Arts and Sciences contributes its share in the realization of the overall Vision and Mission of Lyceum of the Philippines- Laguna. Faculty line-up is composed of teachers who are experts in various fields and who have broad experiences in teaching. Faculty members who handle major subjects are mostly industry practitioners who have extensive experiences in the related field. General Education teachers likewise are experts in their respective fields and have acquired specialization in their post-graduate and doctorate degrees. The AB Communication Program aims to develop among students a comprehensive understanding of the nature, dynamics and application of communication in sectors as diverse as industry, government, education, and development. Using a generalist approach, the curriculum trains students to gain knowledge and skills for varied channels like print, photography, radio, television, theater, and film. It also provides practical experiences in public relations, advertising and development communication. In addition, the program includes an on-the-job training program in communication- related institutions and thesis writing as the culmination of their academic curriculum, thus preparing them to become media literate, socially aware, and responsible communication professionals. BS Psychology Course intends to develop and expose students to human behavior and experiences within the context of organization. Undertake research using knowledge and skills in psychology, and communicate the results of such research to both specialist and non-specialist audiences. Designing, managing and evaluating communication campaigns. 2. Demonstrate understanding of the ethical dimensions of the use of psychological theories and methods. 3. Undertake further training for developing existing skills and acquiring higher level competencies either through formal graduate education or in an employment context. The Bachelor of Science in Biology is a four-year college course that is structured as a generalized framework of study with the end view of grounding students with the fundamental concepts, principles, and theories of the biological, natural and physical sciences and the conduct of research. This includes the acquisition of appropriate skills, and training in the efficient processing and presentation of information in both written and oral form. 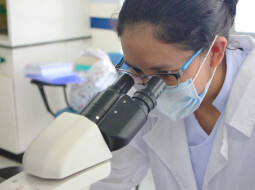 The BS Biology program is structured to meet the needs of professional biologists who can be employed in government/private institutions and other agencies where scientists with biological expertise are needed; can engage in entrepreneurial activities; conduct research in the various areas of biology; undertake post graduate education in Biology and allied fields; pursue a career in teaching. Graduates of BS Biology can work in research, academe and Biology-based industry, or choose to continue with Medical education. The BS Biology curriculum presents balance treatment of various topics such as the CHED-mandated general subjects; the essential Biology-core courses with laboratory classes; non-Biology tool subjects; science electives and Special Problem or Thesis Presentation. Students will be exposed to the different aspects of Biology through lectures, laboratory work, research, and field trips. Celia A. Tibayan is a graduate of Bachelor of Mass Communication and Master of Arts in Communication Management, both from Pamantasan ng Lungsod ng Maynila. She is currently taking Doctor of Philosophy in English Language Studies at Lyceum of the Philippines University (LPU)-Batangas. She joined LPU-Laguna since 2005 as a faculty in Languages and Communication department.